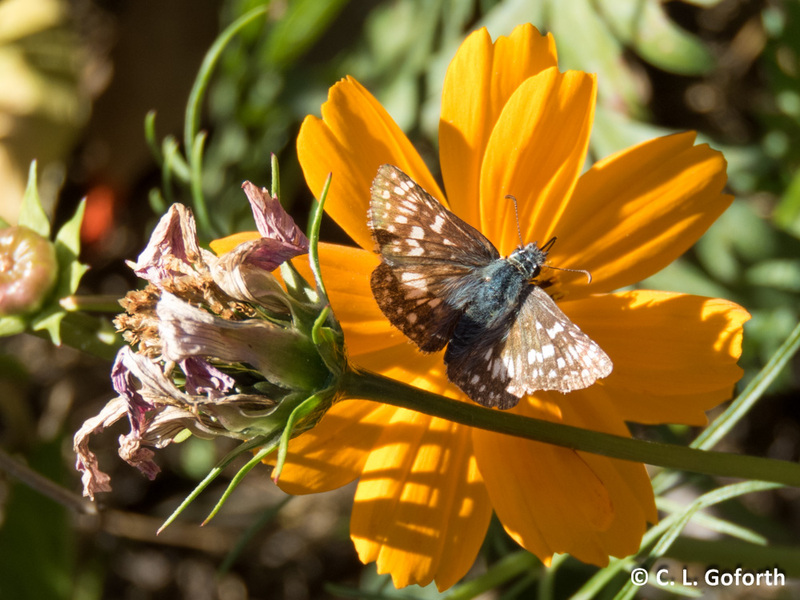 “Connect” is today’s Photography 101 topic and I decided that a photo of pollinators was in order. 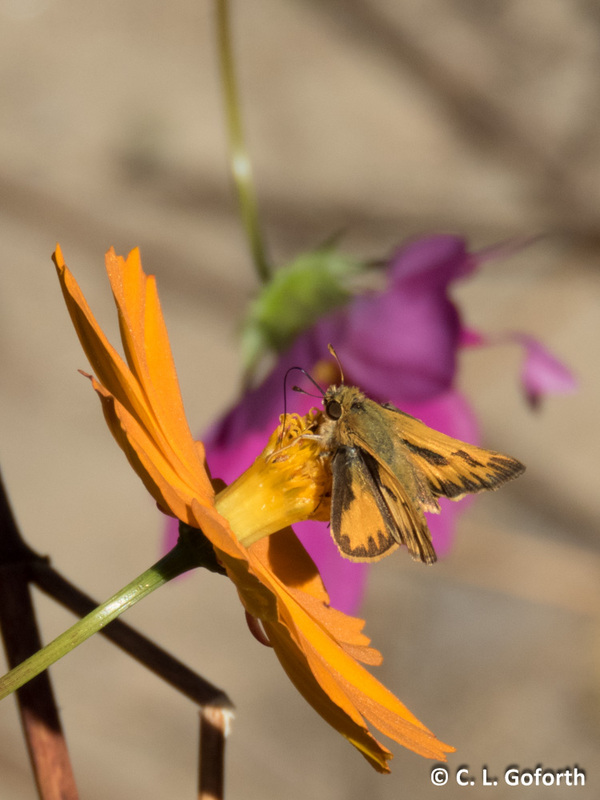 After all, the connection between pollinators and the plants they pollinate is incredibly important. 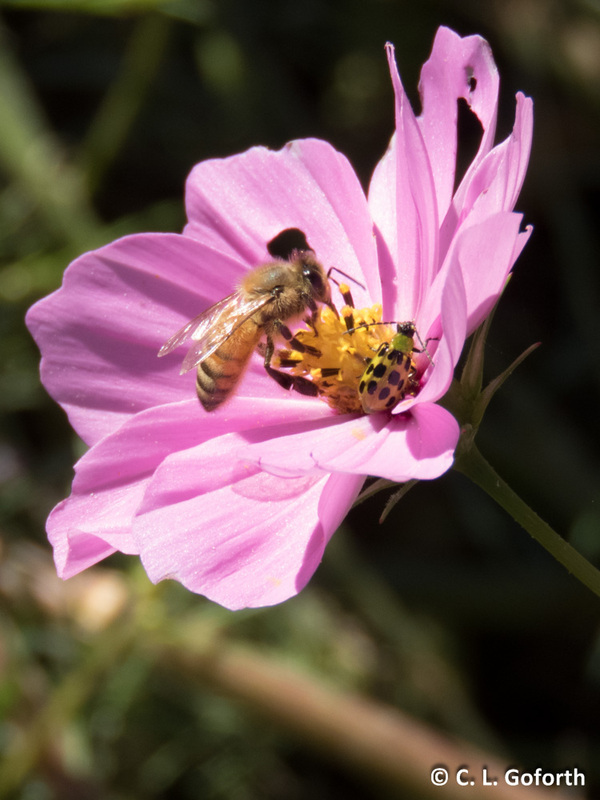 The mutually beneficial (usually) relationship means the bees get fed lots of sugary nectar and/or protein-rich pollen and the plants get their pollen moved about. 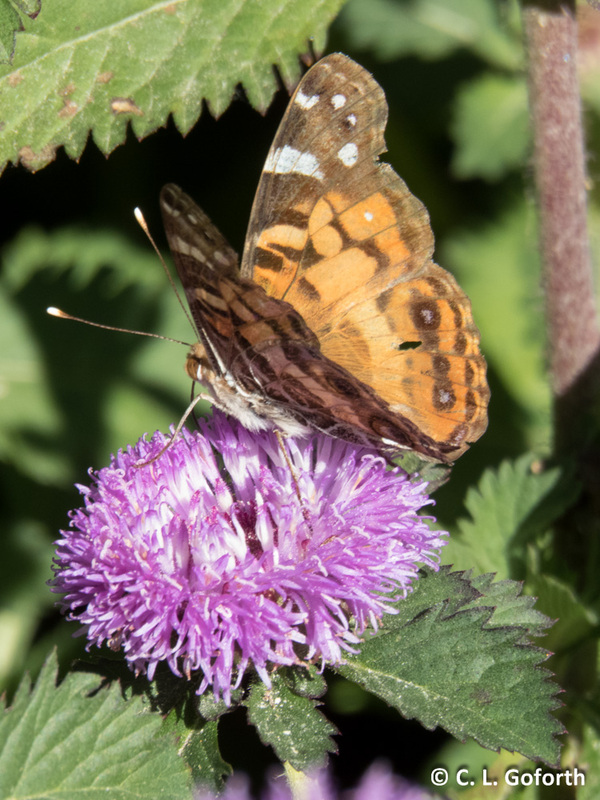 It’s a pretty good deal for both the pollinators and the pollen producers! 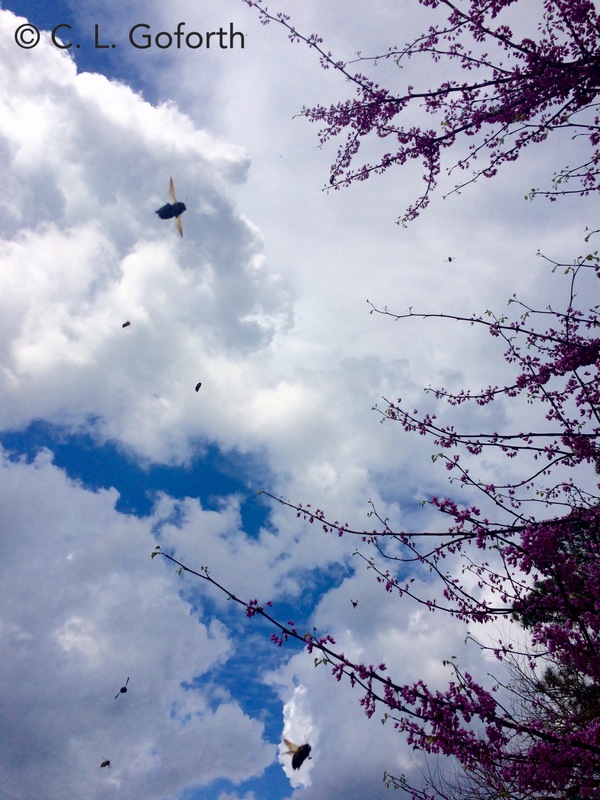 The number of carpenter bees flying around this tree was astounding! 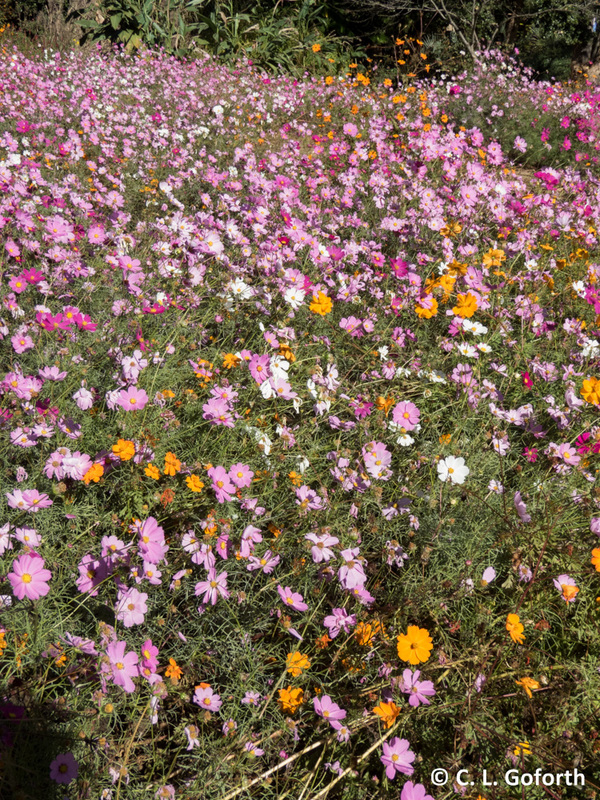 I loved it, stood under the tree for a while and let the bees swirl around me. A rather magical experience overall! Maybe it’s the time of year, but last week I started thinking “I need a new project.” Not a science project – I’ve got a ton of those already. No, this needed to be a personal project, preferably something that involved creating with my hands. I quickly developed a pattern for a little elephant plush and made a few of them, but it wasn’t enough. I needed something bigger, something that involved a bit more heavy construction. It hit me when I noticed a fallen tree branch in my yard as I was cleaning up after my dogs (a great time to think by the way! ): I needed a new bee house! A fancy bee house! It was too late for a trip to the hardware store at that point, so I drew up my plans and headed out early Saturday morning to get the supplies I needed. I am seriously the worst woodworker on the planet, so this project could have ended in disaster, but I’m rather pleased with the results. Thus, I’m going to share the plans with you all today! — Three pieces of equal sized lumber. I bought a 2″ x 10″ x 10′ board and had the hardware store cut it into nine 11-inch long pieces (enough for three houses) plus one smaller reject piece. (I have a good saw, but honestly I didn’t want to bother.) The piece of wood you choose can really be anything that’s more than 6 inches deep, so go with what feels right! My boards ended up being wider than they needed to be, so I would get something a little less wide next time, something in the 8 inch depth most likely. — Long drill bits in assorted sizes. I used 1/4 inch and 21/64 inch, but anything between 1/4 and 3/8 inch or so works. 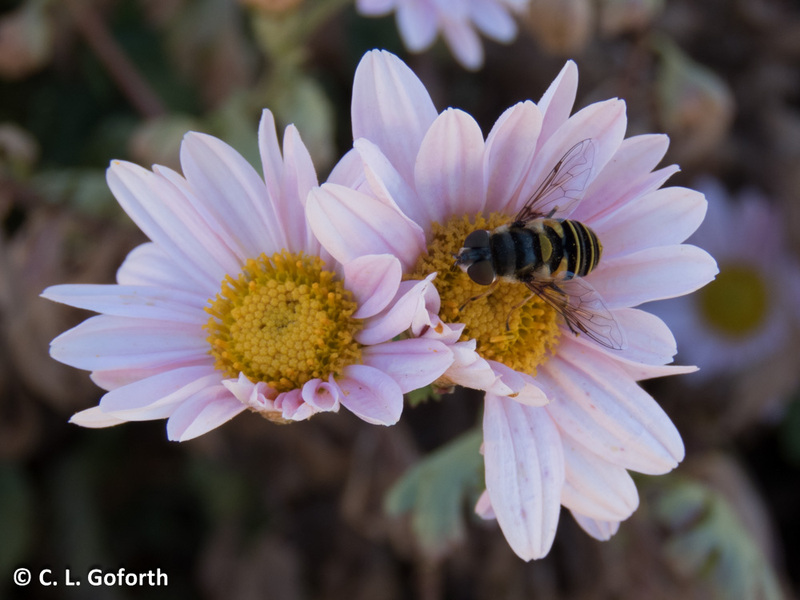 The more different sized holes you provide, the more species of bees you might attract! 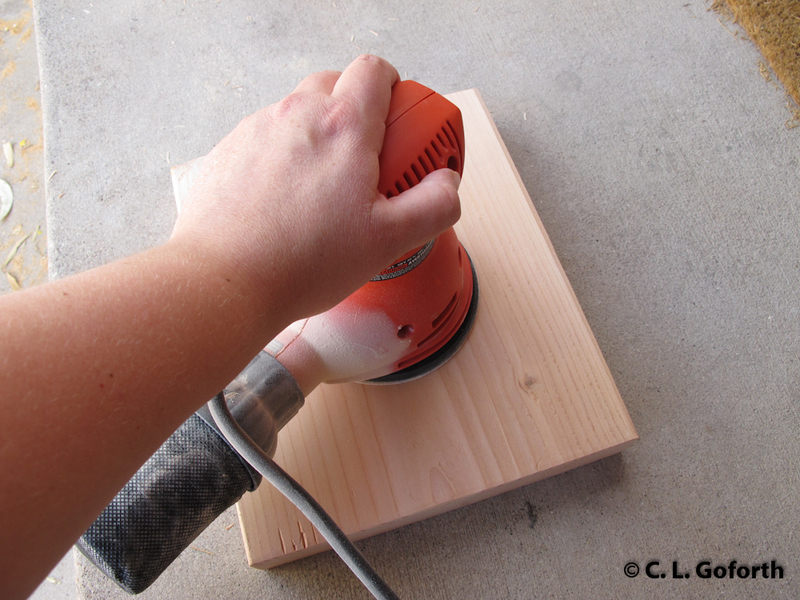 — Sandpaper (and a sander if you have one, but you can just rub the wood with the sandpaper by hand if you don’t). I used 120 grit paper, but considering it’s going to be sitting outside I didn’t bother with getting it perfectly smooth, just enough to get rid of rough edges. — Wood stain (optional). I like the stains that stain and seal in one. This gives the wood a nice finish, but also protects the wood from the elements to some extent. I went with the walnut stain. For a more rustic look, you can leave the wood unfinished. — Foam brush or other paint brush. 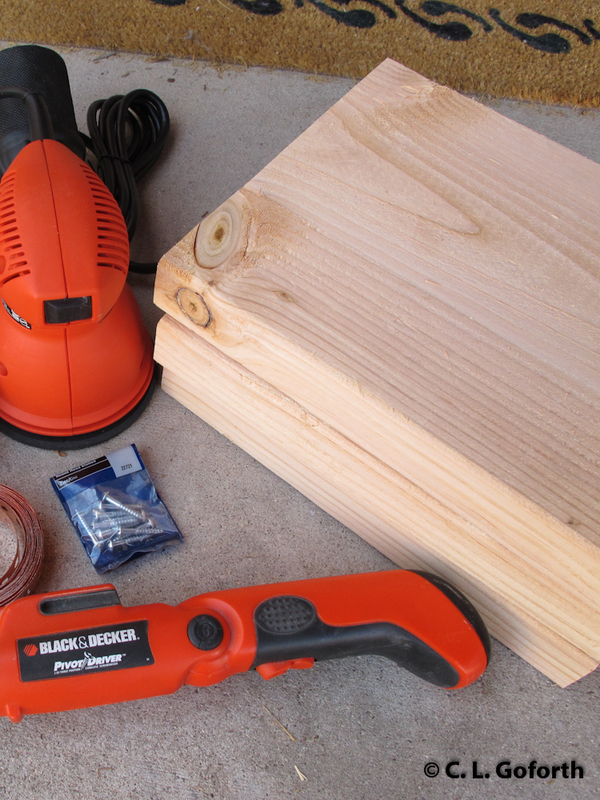 If you don’t have them cut at the store, cut your board into three equally sized pieces. 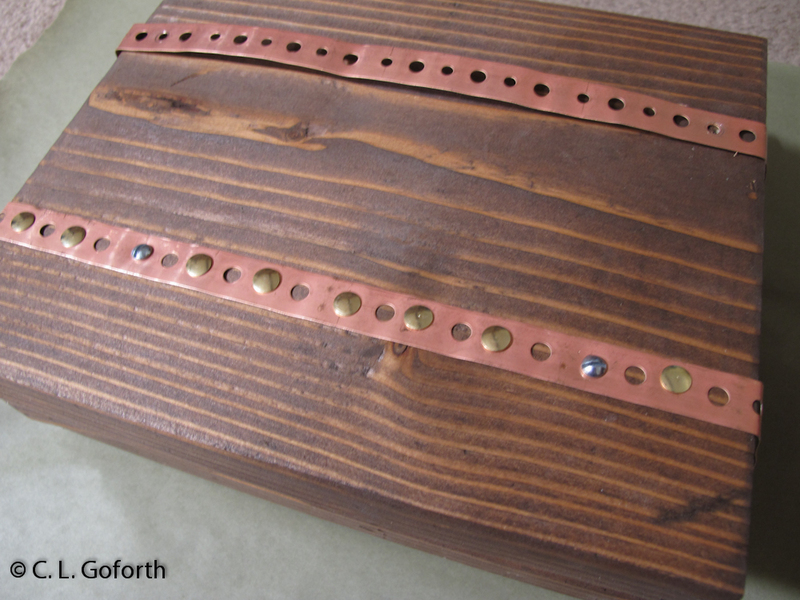 Drill the different sizes of holes in whatever pattern you find appealing along the narrowest edge of the board. Drill as deep as you can, avoiding the edges. If you’re a perfectionist and abysmal woodworker like me, trust me: random hole placement is the way to go. 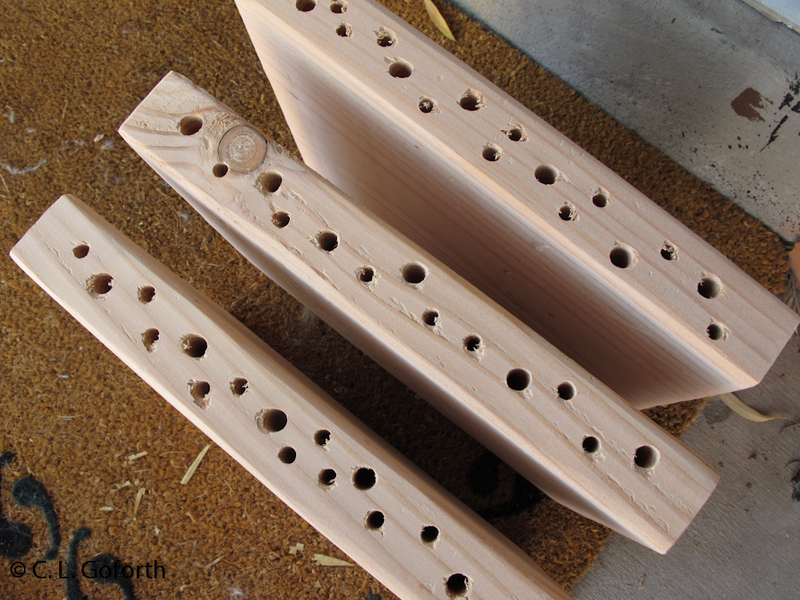 You’re never going to get the holes lined up as nicely as you’d like without a drill press and a good workbench and it will just frustrate you if you try! Sand every side of the boards, making sure the edges and the drilled holes are free of any sharp pieces that could result in splinters. I used an orbital sander and it made quick work of this step. Look over your boards and choose the two pieces that have the most pleasing appearance to be your top and bottom boards, then sand those especially carefully so that they’re quite smooth. This step is optional, but I wanted to protect the wood and make it darker. If using, place the boards on newspaper or masking paper, then apply the stain in a thin, even layer. You really don’t need to stain the parts of the board that will be hidden inside the bee nest, so I only stained around all the edges and what were going to be the top and bottom edges. 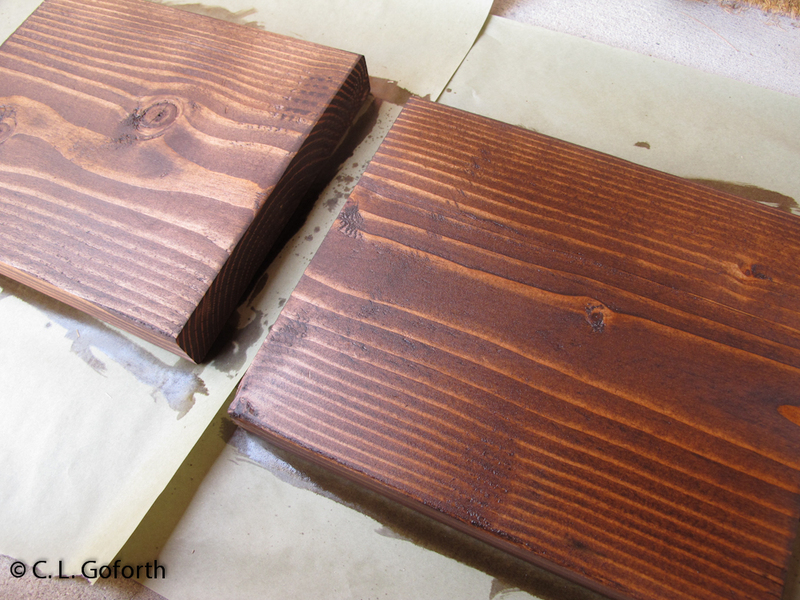 Wait 5-15 minutes and then gently and evenly wipe any remaining stain from the boards. Let them dry for at least a few hours, or even overnight. If you want to make the nest extra weather resistant, you could seal the wood with polyurethane or some other sealant at this point, but I wanted my wood to look a little rustic and left it with just stain. Apply a thin layer of glue to the bottom of the top board and fix it to the middle board. Do the same with the bottom board on the other side. Make sure all the holes are facing the same way! This will make the next step a lot easier. Pile a few books on top and leave to dry overnight. You could even stop here if you want to keep things simple. 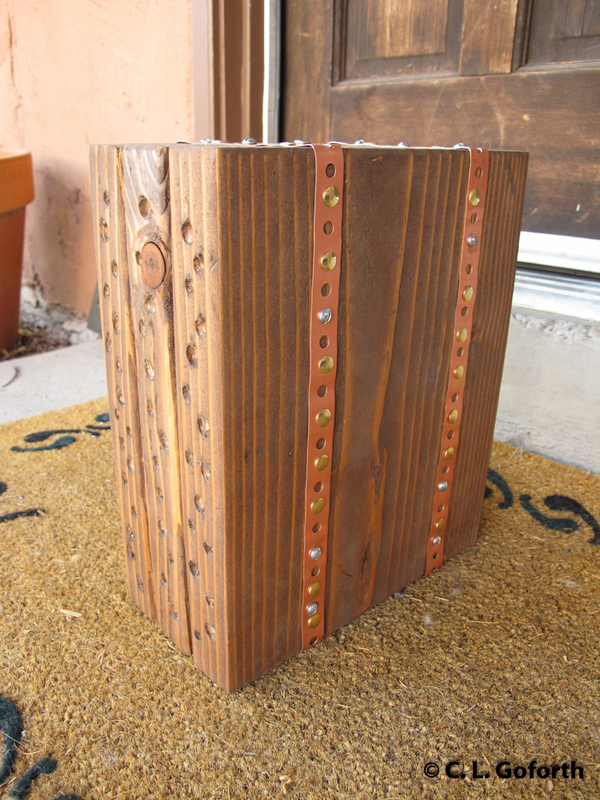 I love the look of the welded metal frames of some bee houses I’ve seen around town, so I wanted to easily duplicate the sort of metal on wood look without buying welding equipment or burning my house down. To do so, I used copper hanger strap. Measure around the house and cut two pieces of hanger strap the measured length plus 1/2 inch. Choose which part of the house will be the bottom. On the chosen bottom, measure in 2 inches from one edge and place one end of the hanger strap there. Drill a screw into the wood through the first hole to fix the hanger strap in place. Then wrap the hanger strap around the house, always keeping it 2 inches from the edge. Use the hammer to bend the strap around the edges tightly. Fix the strap in place every 3 inches or so along the long edge by adding a screw. Use one screw in each board on the narrow sides. Repeat this step on the other side of the bee house so that there are 2 bands of hanger strap around it. 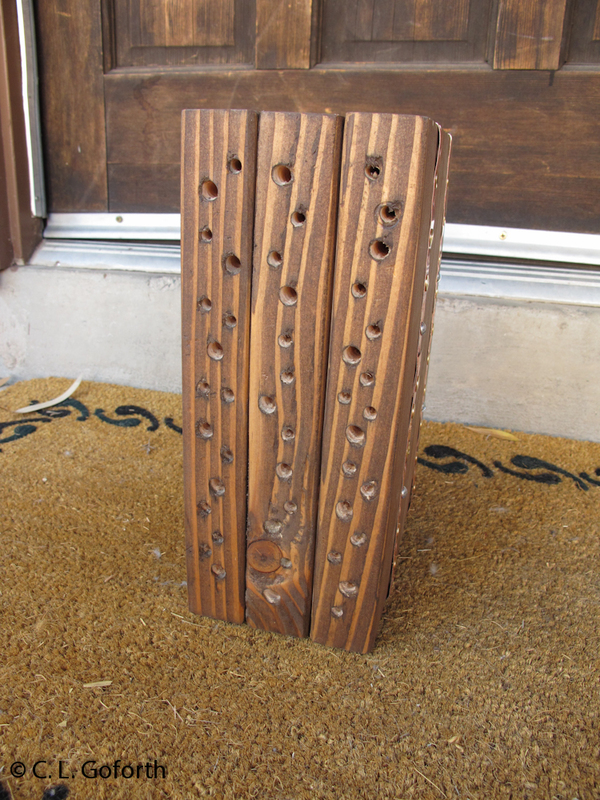 I decided to jazz up my bee house a bit more by pressing gold thumbtacks into the hanger strap at regular intervals. Simply press them into the gaps in the hanger strap, then tap them gently with a hammer to seat them well. Once complete, the bee house should be placed somewhere it will get shade during the day so it won’t get too hot for the bees. 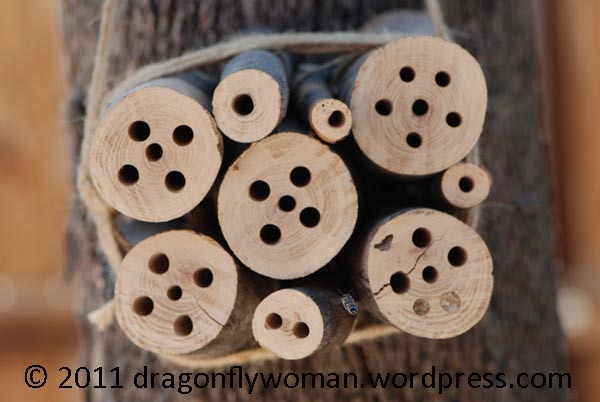 I’m going to thread some wire under the hanger strap and hang mine from the tree my other bee house is in, but you could simply set it along a fence, retaining wall, or raised garden bed too. It could lay flat or stand vertically – your choice! 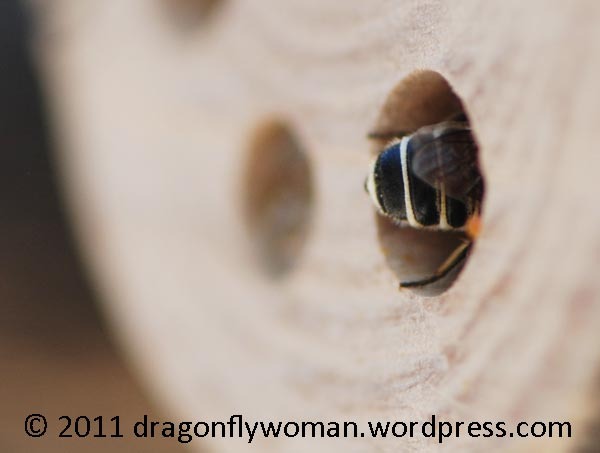 Enjoy watching the bees build their nests in their new bee box! I bought enough supplies for 3 bee houses and they ended up costing $12.74 a piece to build. Not a bad deal for several years worth of bee observing happiness! My new nest looks just how I wanted it to, was easy to build (seriously, if I can do this anyone can! ), and will provide extra cavities for my yard bees to build nests in. And, I don’t need three nests, so I’m giving two away as gifts. 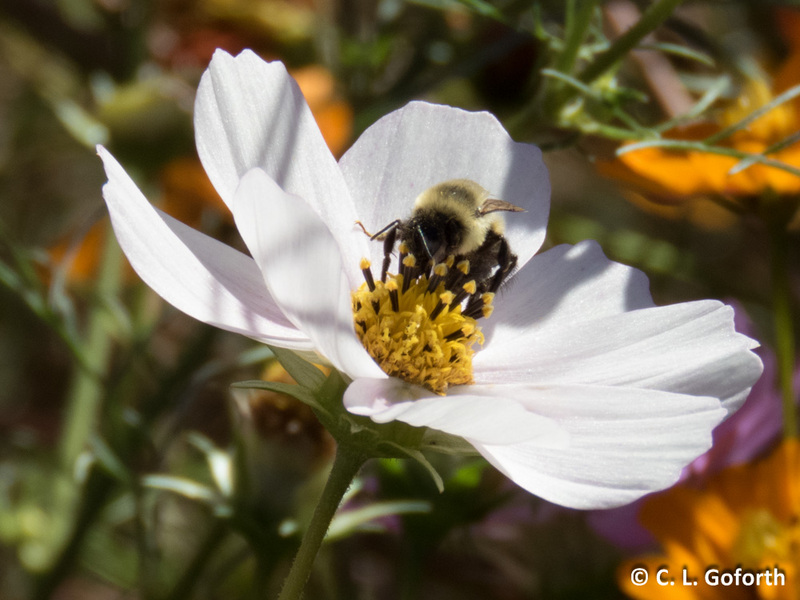 What can be better than the gift of native bees? Now I’m itching to come up with some new designs… I’ll post them here when I do! Want a printable copy of this tutorial? You can find it here! 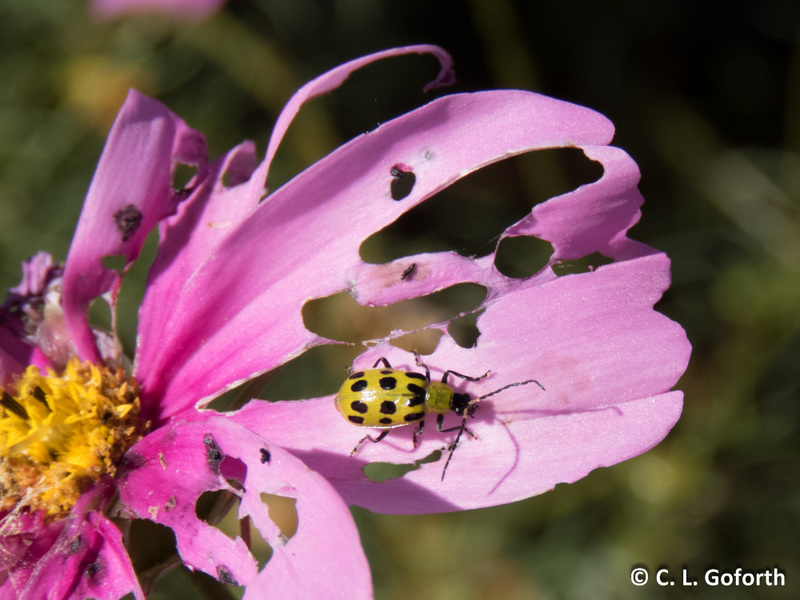 Well-Nigh Wordless Wednesday: This is not a bee. 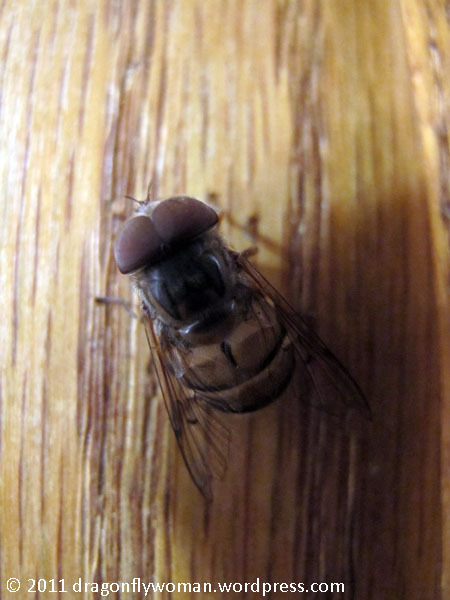 I have seen a number of otherwise calm, rational people completely panic and either a) start running around hysterically (sometimes screaming a bit) because one of these flies was “chasing them” or b) curl up into the fetal position, apparently hoping that they will spontaneously achieve telepathy and convince the fly to leave. Attention all Tucsonans: it’s a harmless fly! If you don’t know how to tell the difference, check out my Monday post for the things to look for to be sure. 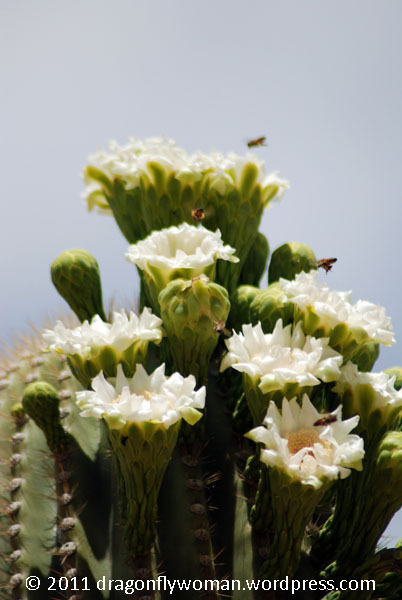 Saguaro flowers - with bees! My bee house was designed to provide cavities to attract native cavity nesting bees and it seems to being doing its job! 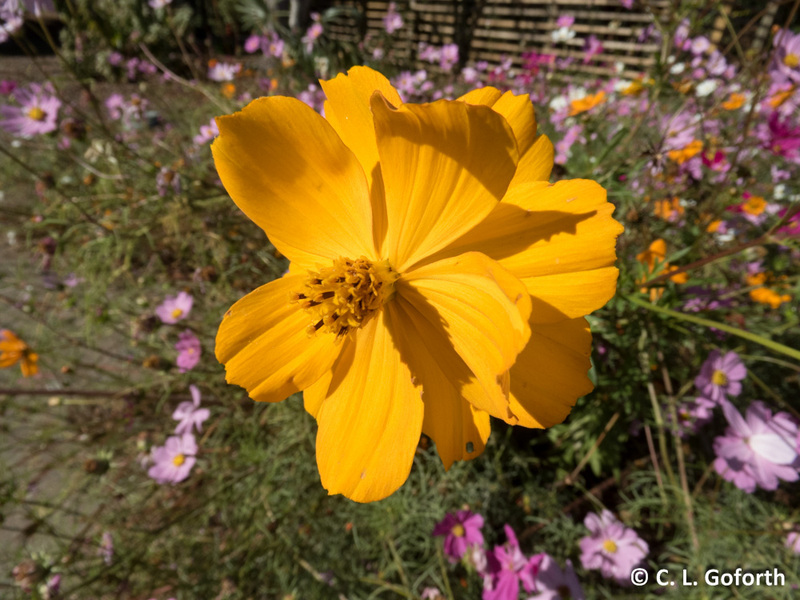 At any given time in the last month, there have been bees looking for nesting sites. 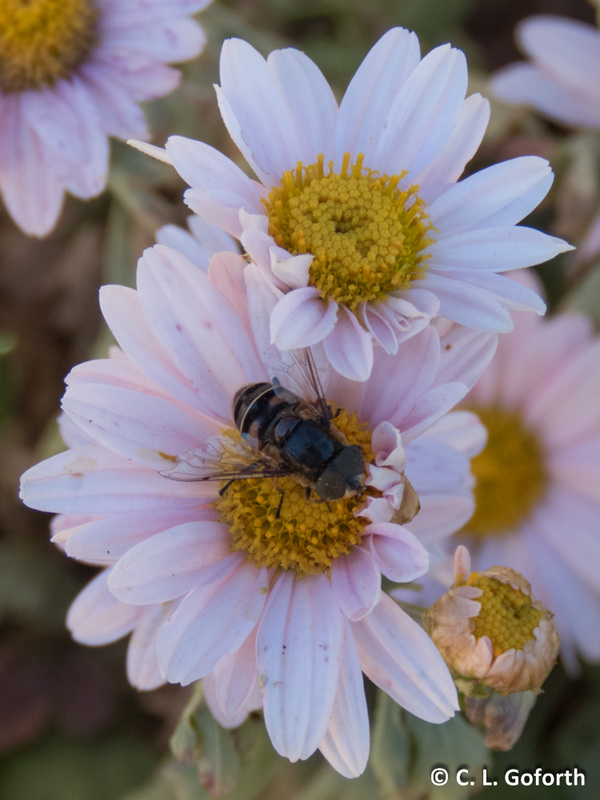 They fly around in front of the bee house (like the bee in the lower center of the photo), find a cavity that looks good, and crawl inside to inspect it. If it is acceptable, they fly off and start gathering nesting materials. If they don’t like it, they fly around and look for a better cavity. After a suitable cavity is selected, the bee starts building cells in her new nest. She flies away from the nest and returns a few minutes later with leaf bits, small rocks, and globs of resin in her mouth. She crawls into the nest head first and starts plastering the walls with the nesting materials. 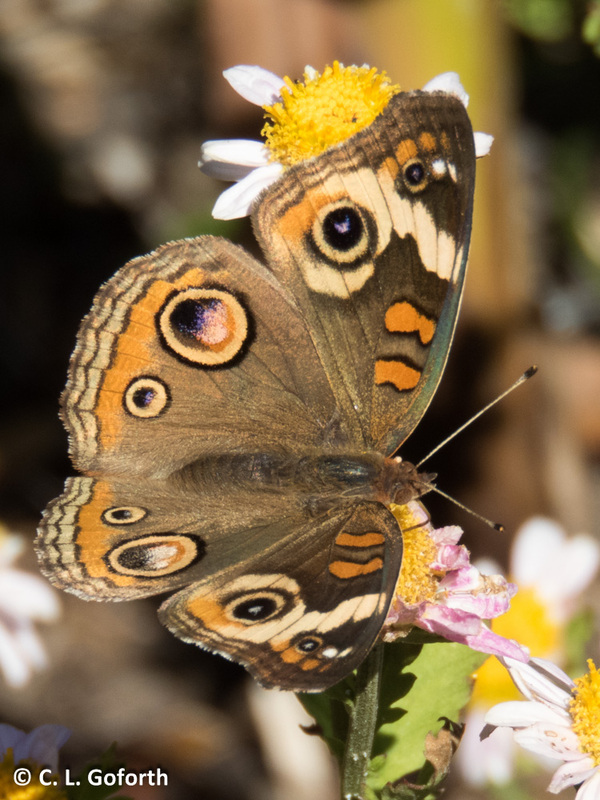 On most trips into the cavity, she carries a load of bright yellow pollen on the underside of her abdomen. 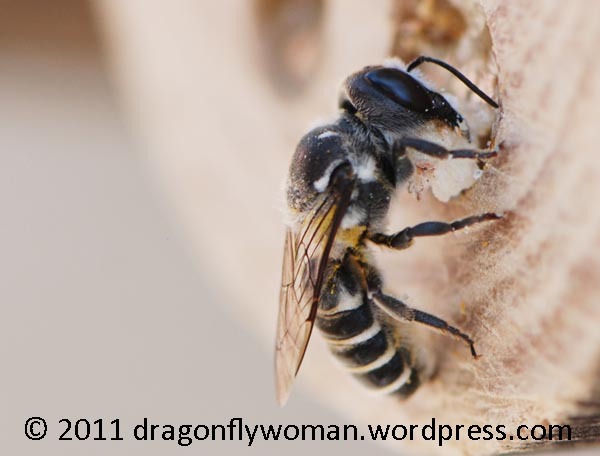 Presumably, she deposits the pollen inside the cell for the future larvae to eat because the bees nearly always come out of the nests clean. 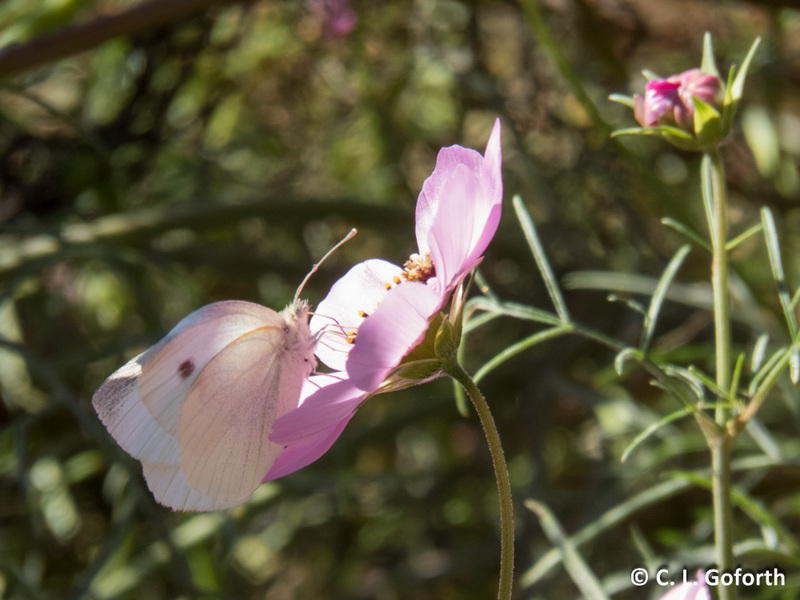 When the cell is about 8 – 10 mm long, they move on to the next step. 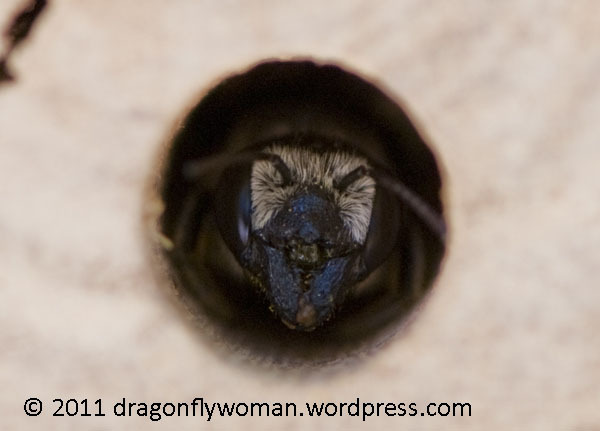 After a cell is completed, the bee crawls all the way out of the nest, turns around, and backs into the nest. She spends several minutes inside the nest laying eggs in this position. When she’s done, she crawls to the front of the nest, pauses for a minute or so, and flies off to start gathering nesting materials for the next step. When the bee returns to her nest after laying eggs, she appears with more nesting materials in her mouth, but no pollen. She then builds a cap for the cell in which she has laid her eggs using the nesting materials. There is a similar wall between every individual cell within the nest. 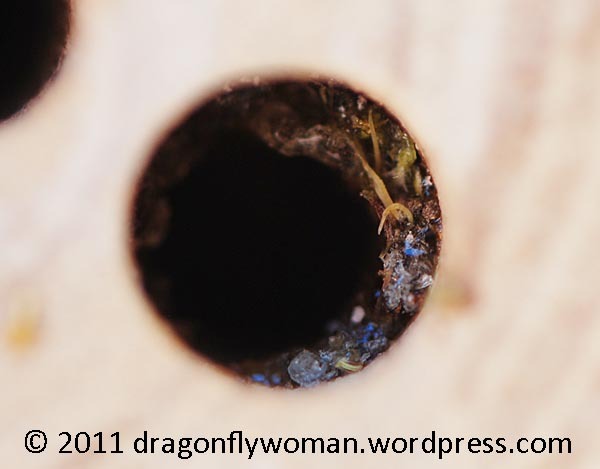 The bees typically make about 8 cells in the cavities in my bee house. Once a cell is sealed, the bee starts a new cell, lays more eggs, and caps the new cell. It’s taking my bees 2-5 days to complete all of their cells, depending on the diameter of the hole and the length of the cavity. The bigger the diameter, the longer the bee takes to build her complete nest. When cavity is nearly full of cells and there is only about 0.5 – 1 cm of the cavity still empty, the bee starts to build her nest cap. She carries leaf bits, rocks, and resin to the nest and starts packing the materials in front of the last cell, often leaving a space between the last cell and the nest cap. She starts building with a mixture of what is apparently leaves and saliva, then starts adding sand, rocks, and resin closer to the end of the cavity. 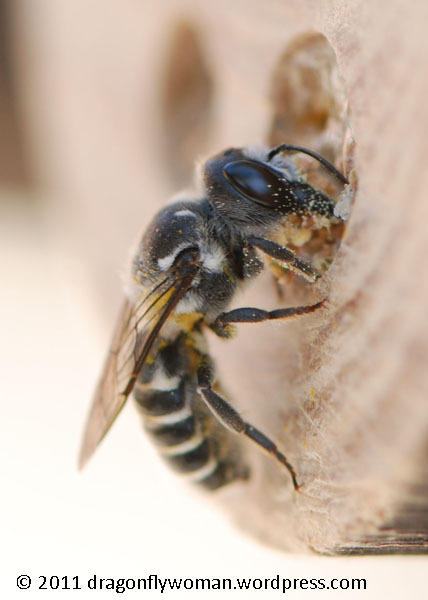 Depending on the nest cap type she builds, the bee may build out beyond the cavity 3 – 5 mm, but many of them are finished flush with the edge of the nest. Most of the bees start a new nest almost immediately after finishing one, often moving into the next closest available and suitable cavity.